We love Toas-Tites. There are no two ways about it. That love means our collection has continued to grow over the years. Here are some pictures and descriptions of our sandwich grills (Toas-Tite and otherwise) to give you an idea of what you can find and the grills that have our hearts. The first ones! The Patent Pending Toas-Tites have the logo on the front with the handles extending out to the left. They also of course say “Reg. U.S. Pat. Off.” at the top and “Pat. Pending” at the bottom. This was the first Toas-Tite in our family. It originally belonged to Boy’s grandmother. Very well loved, indeed. 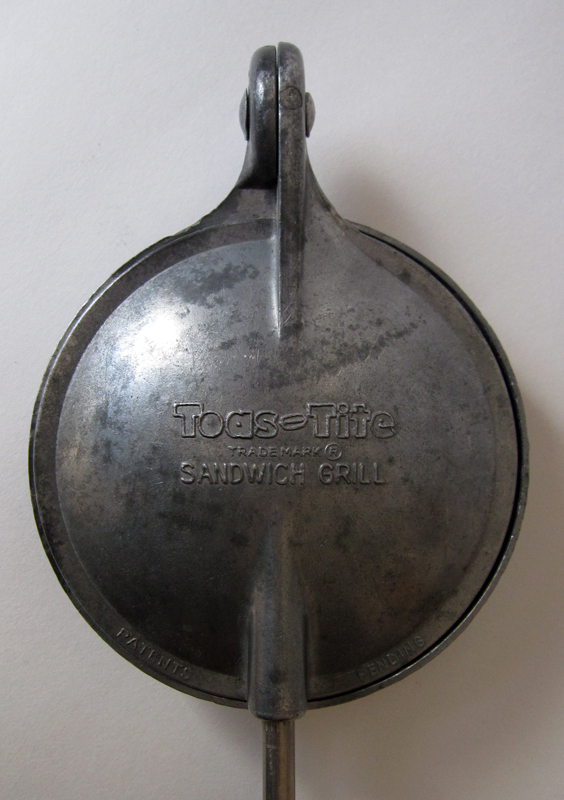 This one was called “Vintage Toas-Tite Red Handled Sandwich / Smores Maker”. It was shipped from San Jacinto, CA and cost $25.49 (plus $7.85 for shipping). 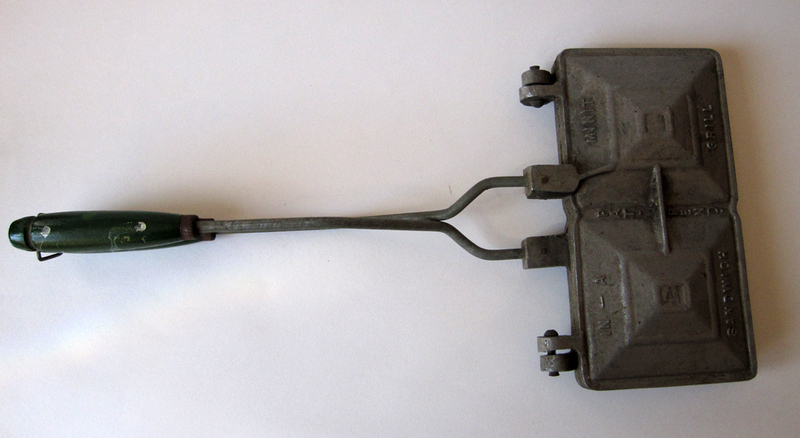 Purchased on eBay – “Nice Vintage Toas-Tite Sandwich Maker” for $57.13 plus $7.30 S&H. On average, we paid $41 for each of our Toas-Tites from eBay (although we had a few which brought that average up like the one that came with the box). The Deluxe Toas-Tite is interesting. Truthfully, the “Deluxe” isn’t that much different from the original Toas-Tite. The primary differences are slightly longer handles, slightly “shaplier” handles with a point at the end, and rather than a wire loop which hooks over the handles, it has a clasp-like hook which holds the arms together above the handles. Another eBay purchase of course. This one was shipped from O’Fallon, MO and cost $36 plus $7.62 S&H. The illusive Tid-Bit. We wanted one of these for a very long time but they’re somewhat hard to find. The Tid-Bit Toas-Tite allows you to make a Toas-Tite sandwich…but it’s divided into four segments! You can tear each segment off for its own tasty little, that’s right, Tid-Bit. It took a while for one of these to come up on eBay but when it did, we snapped it up for $109. It rolls the best elements of a Toas-Tite and a pull apart bread together. Delicious. We own one Boy Scout Toas-Tite. These units are a bit more hard to come by than the original Toas-Tites or even the deluxe versions. They were produced exclusively for the Boy Scouts of America. They are smaller than the original Toas-Tites both in terms of clamshell diameter and in handle length. The clamshell is also thinner and smooth, with no ridging of the original Toas-Tite design. It also has a slightly different hinge at the top of the clamshell. 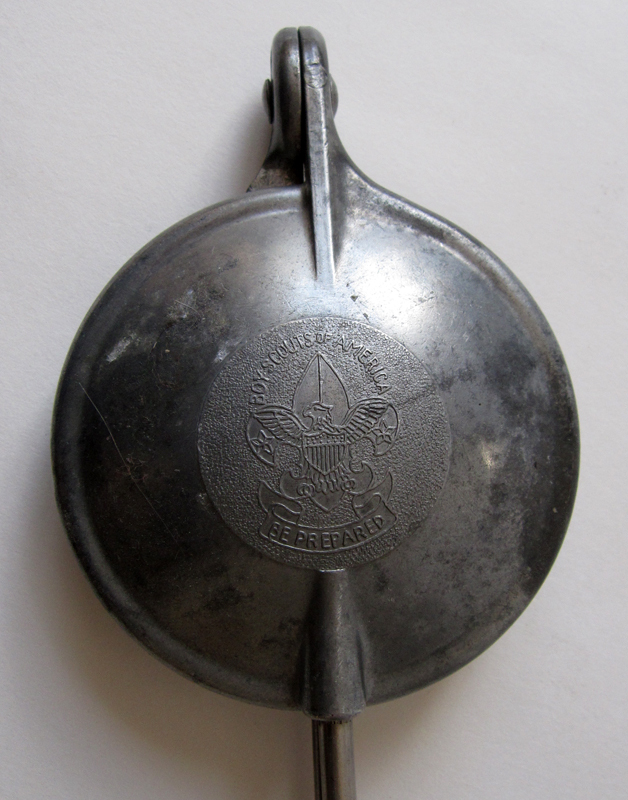 The Toas-Tite logo displays on one side and the crest of the Boy Scouts appears on the other side with their slogan “Be Prepared.” It includes “Patent Pending” on one edge as well. 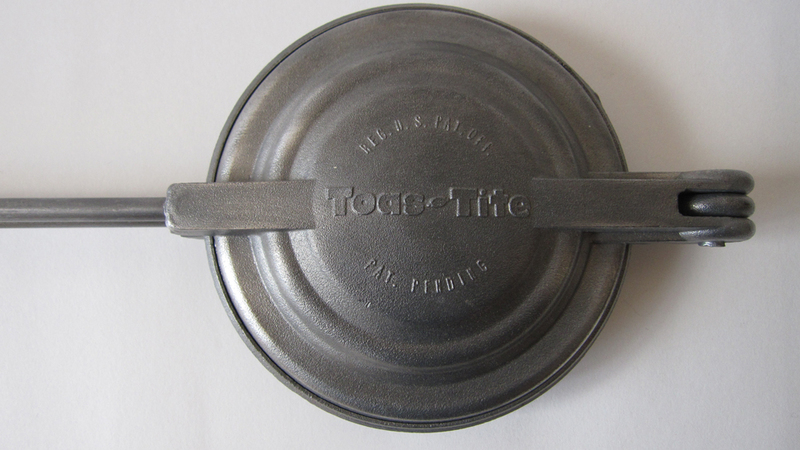 We purchased this Toas-Tite on eBay (“Rare Toas-Tite Vintage Boy Scouts Patent Camping Grill”) for $66.09 plus $8.09 S&H. Yes, this one is called the KwiKi-Pi. Because who doesn’t want a quicky pie? The front of the grill claims Reg. US. Pat. Off. Pat. App’l. The metal is thinner than a Toas-Tite and the top clam shell fits into the bottom clam shell entirely. We bought this one on eBay for $15 (plus $10 for shipping). This very long handled sandwich grill is seriously heavy duty. It’s a great grill if you’re toasting in an open fire because of the extra length. This unit was produced by C. Palmer Mfg. Inc. in West Newton, PA 15089. 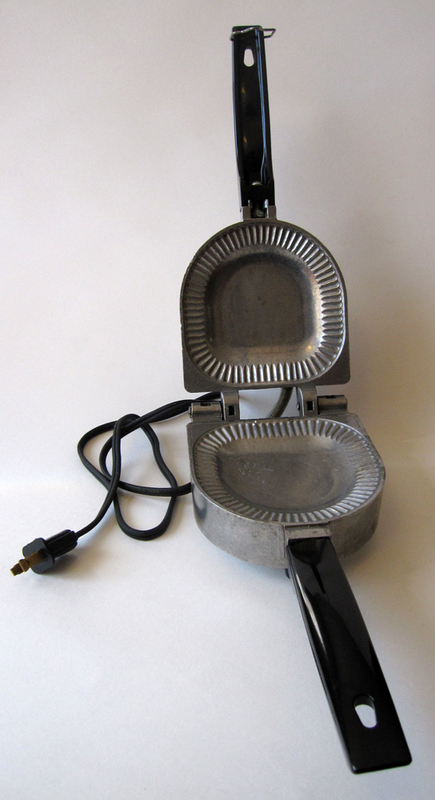 We got this one on eBay with the description “Vintage Palmer Pie Chef Camping Sandwich Maker Cooker” for $9.99 (but the shipping cost us $16.09). It arrived from Boothbay Harbor, ME. 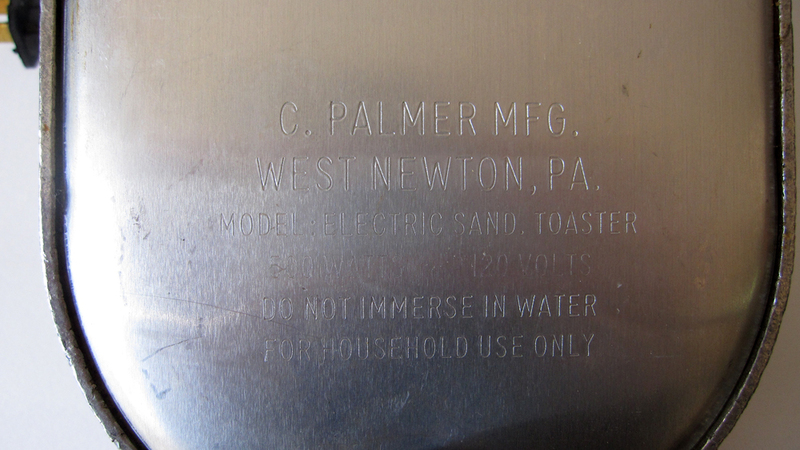 Amazingly, this one was also produced by C. Palmer Mfg. also in West Newton, PA! This one was added second, after the Campers Pie Chef grill. The model on this one just says “Model: Electric Sand. 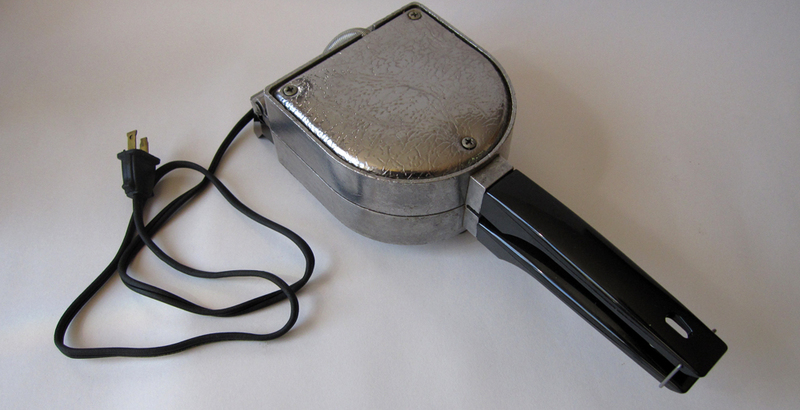 Toaster, 500 Watts – 120 Volts”. It also warns on the bottom, “Do Not Immerse In Water – For Household Use Only”. We got this one from Toaster Central for $88 (plus $17 for shipping). It’s fully electric with no flipping or stove top involved at all. The top of the unit is flat while the bottom is scalloped. It’s also scored along the edges to help press the sandwich edges together. It doesn’t seal the edges quite as well as a Toas-Tite but it’s pretty handy when you don’t feel like flipping your sandwich while it’s toasting. 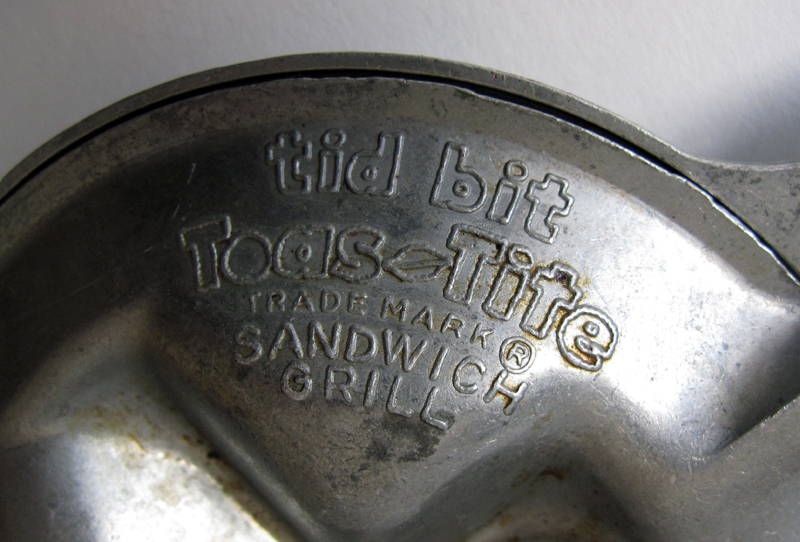 This sandwich grill is marked “In-A Minit Sandwich Grill” – patent pending. The grill makes two sandwiches in one go. It cost $9.99 but because of the significantly heavier weight than a Toas-Tite, shipping and handling cost a whopping $18.45 from Broomall, PA. The Waffle Dog was gifted to us from Boy’s aunt (thanks, Aunt Sharon!) – it’s not quite a sandwich toaster but it’s in the general family. It has two slots for hot dogs and a waffle inside where you pour your batter. It also has two little holes at the bottom where you can place your sticks to finish off your corn doggy experience. We haven’t used it yet but we’re hoping to soon! This Toas-Tite box came from eBay (with a patent pending Toas-Tite). It’s in reasonably good shape considering its age and it came with the original instruction manual. The top of the box says: “Reg. US Pat. Off. Pat. 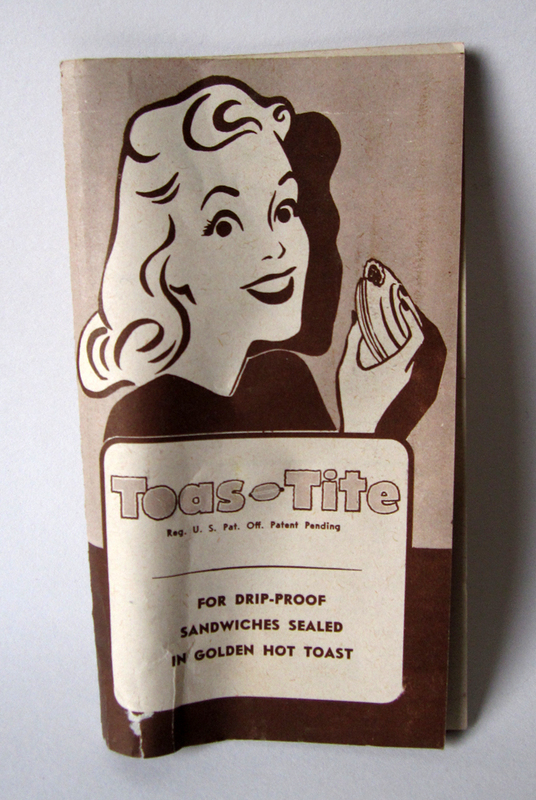 Pending – Toas-Tite – Makes a Luscious Sealed-In Drip Proof Hot Toasted Sandwich – Make Toas-Tites on the gas stove – For Quick Lunches – For Midnight Snacks – Parties – Use Toas-Tite Over the Picnic Fire, Hearth Fire, Grill, Or Any Open Flame”. It also has cute little depictions of both of these cooking methods. 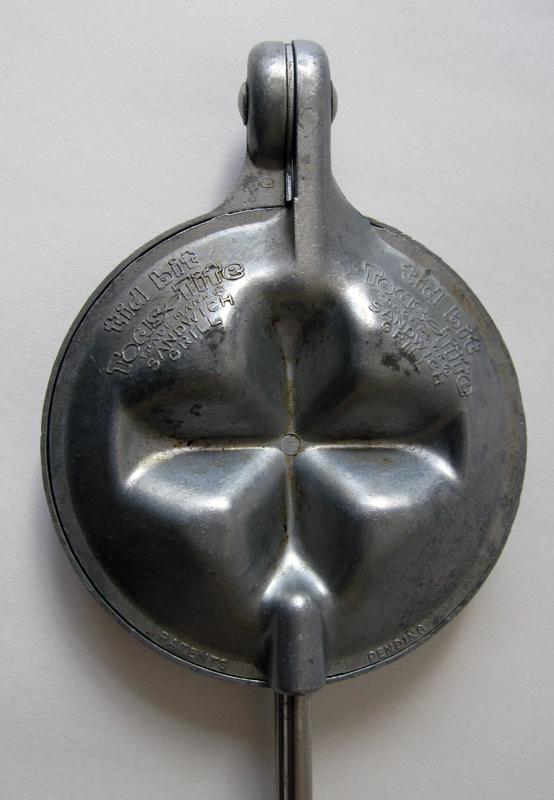 The side of the box repeats the slogan (“Makes A Luscious Sealed-In Drip Proof Hot Toasted Sandwich”) and “Manufactured By Bar-B-Buns, Inc. Cincinnati, Ohio”. For the full transcript of the instruction manual, head over to our Toas-Tite Instruction Booklet page. I just purchased my Toas-Tite at a yard sale for $3. I fondly remember my Toas-Tite sandwiches as a kid in the 60s (I’m 58). My brother got the Toas-Tite when we broke down the folks’ house. So I snapped this one up on a whim. I just successfully made ham and cheese Toas-Tites for my husband and me on my glass cooktop. Imagine my surprise when I Googled it and found your extensive Toas-Tite tribute site! I want to tell you that there is a Boy Scout Toas-Tite on ebay right now for around $75, in case you’re interested. Congratulations! I hope you’re able to make all kinds of new memories with your new found Toas-Tite. We just purchased a Boy Scout Toas-Tite from Ebay for around $45, so to hear you found one for $3 is amazing! I hope you enjoy your new found treasure, thanks for the comment. Lovely collection! I am in Australia and have quite a few ‘jaffle irons’ as we call them over here, some of which look fairly identical to the toas-tite, most of the newer ones here are square though, however some of the older squaure ones often have ‘bakelite’ handles which are nice. I abosultely love jaffles! Last night I went camping and make a Christmas pudding and custard one for dessert – yummo! One of my favourites is Chocoloate Tim Tam biscuits and banana. Another nice one is potato, mushy pea and gravy! Having aquired an interest of late in toas-tites, I’ve negotiated with a seller in the US and bought a pre-patent, 2 post-patents, tidbit and Boy Scout Toas-tite as well as a UFO-to-GO by Hearthsong. They will be wonderful to add to my collection. 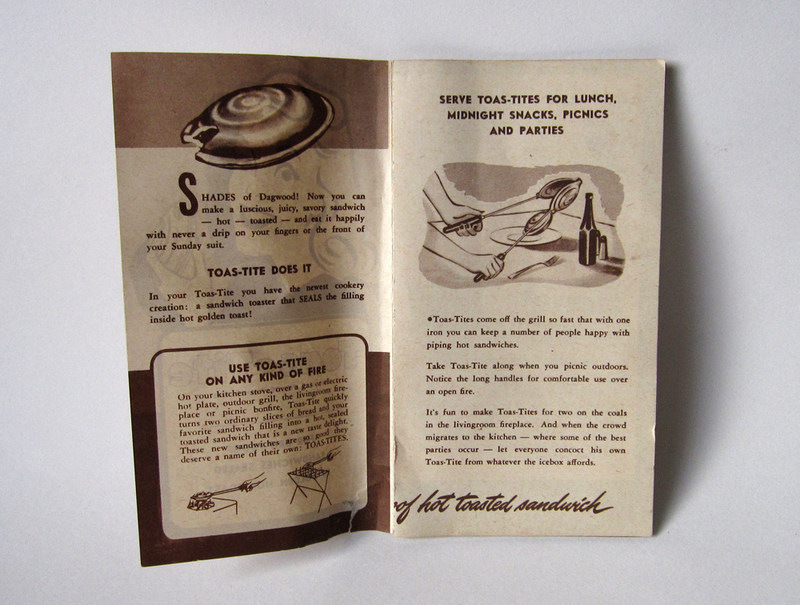 Love your website, I am very interested to learn more about toas-tites history and more recipes! Hi Girl well I received all of my toas-tites and was really happy with their condition – the pre-patent hardly looks like it has been used. Last night I went hunting for mud crabs on the local river with some mates and besides seeing a late night full eclipse of the moon on the quiet river and drinking some high quality connesiur beers I made a number of jaffles including a delicious Gourmet Pastrami w Jarlsberg Cheese jaffle followed up with dessert : Xmas Fruit Pie w Custard jaffle. Delicious! 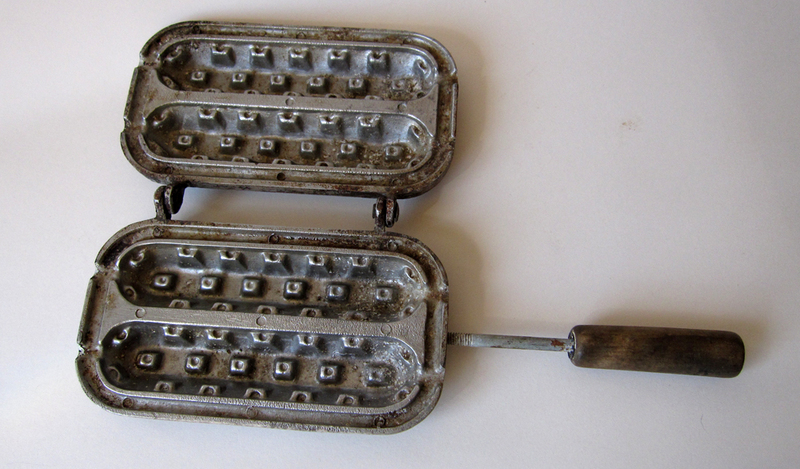 I compared cooking with the toas-tite to the Australian square jaffle iron (cast iron with bakelite handles, around 1960’s) – the Oz iron takes a lot longer to heat up but once it gets going….however the toas-tite seemed to provide a much nicer golden brown look to the cooked jaffles, plus the round jaffles are so much nicer to eat than square ones. Tonight I will try a chili mud crab jaffle followed by Turkish Delight Tim Tam Chocolate biscuits and banana jaffle for dessert…. Truly love those toas-tites might buy some more! While perusing one of my favorite websites, I came across the Toas-Tite. I had NO IDEA what the heck the contraption was used for but surmised it had something to do with food, since it came with a recipe booklet. Thinking myself somewhat of a gourmand, this was all the encouragement I needed. I headed to the interwebs to find out just what delicacies could spring forth from such a contraption. Well, Google led me straight to you. After looking at your site, I am pleased to announce that I have purchased my very own Toas-Tite & now await its (expedited) shipment to my door! Thanks for the recipes! Much health and love to you both! Thank you so much for the kind words and we hope that you have as much fun as humanly possible with your new kitchen contraption! It always brings a smile to our face to here that someone will be trying a toas-tite out for the first time. We hope you enjoy the wonderful creations, and we’ll be coming out with new recipes very shortly!